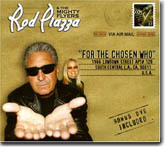 Rod Piazza & the Mighty Flyers have still another hot new disc in For The Chosen Who. It's this month's Pick Hit. Can't get enough hot Chicago blues harp? Then be sure to search out the Severn collection of six harmonica aces. It's called Diamonds In The Rough, and this great compilation of a dozen tunes is this month's Surprise pick. This month's Flashback features a collection of rare recordings from Memphis radio station WDIA, with cuts from Rufus Thomas, Pigmeat Markham, and other Memphis radio performers. This month's What's New section features new releases from Mighty Mike Schermer, Harper, Michele Lundeen, Nico Wayne Toussaint, Jimmy Thackery, Popa Chubby, Elam McKnight & Keith Carter, Mojo Stu, Richard Ray Farrell, and more.